BIGSOUND, Australia’s biggest music industry conference, which takes over Brisbane’s Fortitude Valley for the best part of a week each year, can be taxing on the minds, livers and wallets of its attendees. In town to not only attend the conference and its live music component but also to perform, what follows is my report of the best live music I witnessed there. Under different circumstances a Melbournite clad in black skinny jeans and pointy leather shoes could have felt a bit out of place in the 32 degree heat Brisbane turned on for Wednesday. Not so during Bigsound, as people from all walks of the industry and from all over the country enjoyed a day of panel discussions and meetings, interspersed with pit stops for coffee and beer. By the time night fell everyone was ready, business cards primed, to see some live music. Arriving at the Bakery Lane stage in time to catch only Billy Bragg’s last two songs made us wish we had planned our dinner break better, but witnessing ‘The Man in the Iron Mask’ and a crowd-aided rendition of ‘A New England’, both from 1983’s Life’s a Riot with Spy Vs. Spy, was nonetheless satisfying. Heading across the road to The Zoo for Stonefield’s showcase, it was interesting, and impressive, to note how much the group has matured over the last few years, moving away from their variations on Led Zeppelin riffs and poses into something more exciting and unique. Freed from her drum stool, a position now occupied by Manny Bourakis, Amy Findlay was able to completely inhabit the frontwoman role, working the front of the stage with a presence previously only hinted at. Amy’s voice was more powerful than ever and the rest of the band, sisters Hannah, Sarah and Holly, were a tight unit, never overplaying nor shying from the spotlight. The cosy surroundings of the Black Bear Lodge provided a uniquely intimate atmosphere in which to watch The Go-Betweens’ legendary songwriter and guitarist Robert Forster. The famously dapper Brisbane native chose to tip his hat to the next generation of local heroes by appearing onstage in a Dune Rats t-shirt and was backed by members of The John Steel Singers. Letting the music do the talking, Forster quickly walked the audience through classics from his back catalogue, his understated delivery captivating those in the front whilst equally being ignored by those further down the room. Their loss. Over at Alhambra Lounge Gay Paris brought the party with their blend of rock, rap and ridiculousness (in a good way). Frontman Luke ‘Wailin H’ Monks, shirtless and sporting a doo-rag, knows how to put on an uninhibited, balls-out rock show, he owned the stage and made sure that everyone was aware that this band wanted you to have a sweaty good time. Having never seen Gay Paris before, the reaction was at first ‘WTF?’, but by the second song they had us won over and we were head banging along. Having broken up in 2011, expectations were high for the rumoured ‘secret’ reunion gig of one Philadelphia Grand Jury. Taking to the Alhambra stage about 1:00am the band proceeded to rip through their catalogue, having lost none of the energy or chops that made them such a fantastic live band. Crazy-eyed and bushy-bearded bassist Joel Beeson jumped around the stage like some kind of rockn’roll version of Brian Blessed, mouthing the words off-mike and generally getting the crowd excited. Their set was a lot of fun, let’s just hope it was a sign of planned future activity for the Philly Jays. By this stage some people had taken themselves off to bed, some were drunk dancing and an assortment of artists who had finished their own shows came and went. Having already performed their official showcase and a house party earlier on in the night, Melbourne’s King Gizzard and the Lizard Wizzard were certainly making the most of their Bigsound experience. Finishing off the first night of music at 2am at Alhambra, you wouldn’t have been able to tell from either their appearance or performance that this was their third set for the night. Beginning with an epic instrumental piece which must have been around 15 minutes in length, King Gizz were sounding like a band at the top of their game. The newer material showed a growth in the scope of their arrangement and musical ambition from the garage-blues that typified their debut LP 12 Bar Bruise, as the band took in various styles and made them their own. Obviously not only confident but competent, there can no doubting that their growing reputation as one of the country’s best live acts is well deserved, theirs being one of the standout sets of the conference. By Thursday afternoon people were getting into the swing of things, with business cards being exchanged, hands proffered, and faces happily scanning the crowd for the next person to introduce themselves to. It was also another full day of panels, meetings, and a great Q&A and performance by Amanda Palmer. Oztix hosted a party at the Bakery Lane stage from the late afternoon onwards, which featured free beer and a cohesive lineup of great rock bands. Money For Rope owned the stage – they are just a damned good band. Their songs embrace the formulas of Aussie pub rock but meld them with occasionally jangly and punchy guitars, vocals that are capable of moving from full bodied shouting to Josh Holme/Iggy Pop style crooning, and with bass lines that have groove and soul. Lovely stuff. Kingswood provided an excellent set and The Lazys got the crowd hyped with their straight up pub rock and a stage act that included their guitarist playing wirelessly from atop a portable room. Over at Ric’s The Bed Wettin’ Bad Boys gave the crowded front bar a taste of sweaty energetic punk rock. The Sydney four piece were great but perhaps the size of the room and the volume of their amps made it difficult to stay for their entire set (“bye industry people!” said the singer as several people made their way to the exit after their first song). Back at Bakery Lounge The John Steel Singers drew quite a crowd, but unfortunately after the high-energy sets witnessed directly beforehand, their laid-back style failed to maintain this writer’s attention (nothing to do with the free beer of course!). The Melbourne Ska Orchestra somehow managed to fit their 25 members onto the tiny Bakery Lane stage, with frontman/conductor Nicky Bomba working the crowd and controlling proceedings as the group performed tracks from their self-titled debut LP and a selection of covers. The energy was high, the mood was joyful and the sound was large. The songs featuring guest vocalist Rebecca Ari were particular highlights, as Ari’s powerful soul vocal and stylish stage presence were like the icing on an already kick-arse cake. Finishing off the set with ‘Automatically Man’, released previously by Nicky’s old group Bomba, the crowd didn’t want the party to stop. Perhaps figuring that they needed to get off the stage somehow anyway, Bomba led the horn section off and out into the street, with the audience following them up to the Valley Mall, as a call and response battle between the horns ended possibly one of the highlights of the entire conference. Having thrown a large afterparty for everyone the previous night, the conference understandably started a little later than the rest of the week on this, the last day of Bigsound. Some felt pleased to have survived the four-day slog, most were hungover. An interesting chat with Regurgitator and a Q&A and performance by Kasey Chambers were pleasant ways to sit through the first half the day, and the free bloody marys were a good move. The final part of the conference was a packed out keynote discussion and performance by Gurrumul. 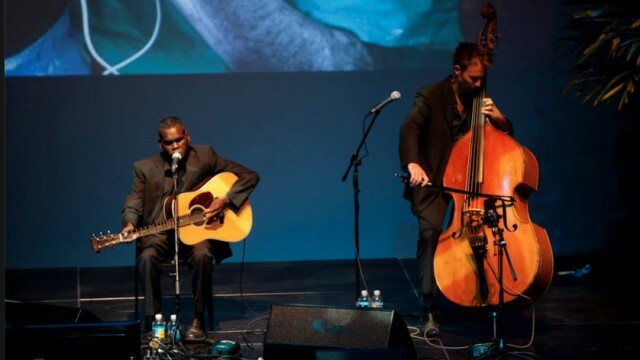 Throughout the interview Gurrumul sat silently whilst his collaborators Mark Grose and Michael Hohnen spoke of the processes involved, and the stories behind the creation of the songs on Gurrumul’s albums, with the singer occasionally pulling a sly smirk or laughing. But when it came to the live performance sections and that man opened his mouth, the sound that came forth made every single person in the auditorium sit up and take notice. Not merely beautiful but astonishing, the audience reaction ranged from goosebumps, to smiles, to tears. Easing into the afternoon at Ric’s, Melbourne’s Damn Terran owned the backyard stage with their furious, scuzzy rock. The interplay between the bass, drums and guitar, as well as the contrast of the two vocalists, Lachlan Ewbank and Ali Edmonds, helped to maintain interest through their use of dynamics while keeping the energy levels consistently high. I went off to play at a house party nearby, where local folk duo Loose Nickers kicked things off followed by The Willow Seeds, whose catchy folk-pop tunes were a delight. Heading back to The Black Bear Lodge we managed to catch the end of Good Oak, a group featuring Thomas Busby from Busby Marou, Nat Dunn and with Jess Ribeiro guesting on certain songs. This band really impressed, both with their songs but also the obvious amount of talent held by its members and the enjoyment they seemed to be getting from performing. If they seemed a little under-rehearsed in sections they pulled it off, with Nat Dunn’s soulful vocals complimenting the rootsy-pop make of the songs. And so ended the 2013 Bigsound, a chance for people from all aspects of the Australian music industry to come together briefly, do business, catch up and see some of the best current live acts around, and damn it was fun. Originally published on Something You Said on 25/09/2013. View original article. Photographs by Elleni Toumpas and John Stubbs, courtesy of Bigsound.